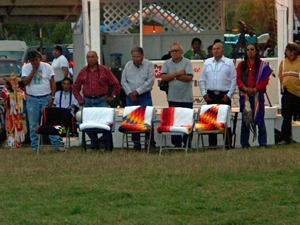 At dusk on Sunday, September 2, 2007, a rare but hope-filled ceremony occurred in South Dakota. During this third day of the pow wow in the community of Porcupine on the Pine Ridge Oglala Lakota Reservation, three men were appointed Head Men of the Porcupine/Pahin Sinte District and, by extension, of the greater Lakota Nation. These appointments were not for show. Head Man is a very serious position for each of these individuals, one which recognizes their lifetime of service as well as one which looks to them to continue to work and speak for the People in an ever-broadening spectrum. Selected by the people and local chiefs, these men are the traditional Shirt Wearers of today, their lives dedicated to the People. There are no comparable positions in mainstream America. Politicians say they are servants of the people but, comparatively, those words are meaningless prattle. The bureaucrats talk much and take much but accomplish little versus these men who risk much and work very hard, ploughing through the bureaucracy, to actually effect helpful change while asking nothing in return. These are not paid positions. So on this Fall evening, after the deceased Veteran’s flags were lowered, David Swallow, Harvey Iron Boy, and Eli Tail stood to publically accept and take up the mantle and dedicated responsibility of the Head Man position. 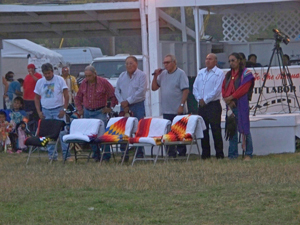 Cedric Young Bear, Tribal Council Federal Monitor, conducted the ceremony with Headmen Francis He Crow from the Oglala District, Adolph Bull Bear from the Kyle/Medicine Root District, and Steven DuBray of the Allen/Pass Creek District assisting with the ceremony. 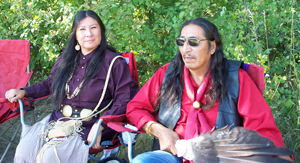 Ken Lone Elk and Francis Chubb Thunderheart were also scheduled to receive the Head Man designation but were unable to attend due to emergencies. Their ceremony will be held at a later date. The three men of this night are all highly Traditional and spiritual men who speak their traditional language fluently. 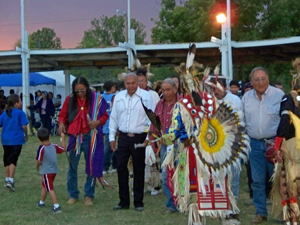 Although their daily lives may be very diverse, they are often found working together on issues they jointly believe to be of paramount importance to their People: economic development, judiciary reform, political/government reform, health and education reform, gang activity, alternative energy development, environmental issues, treaty issues, and the end of corruption on the reservation. Eli Tail (70), the eldest of the three, has a long history as a Treaty Advisor and human rights activist. A member of the Sioux Nation Treaty Council and an Executive Board Member of the Northern Plains Film Commission, he has written and helped to produce two movies, “Through Lakota Eyes” and “The Warriors Ride”. He and his wife, Carolyn, also recently founded a vocational/alternative high school called Cokan Tiospaye Owayawa in their community of Evergreen on the Pine Ridge Reservation. Tail is also founder and President of the Sinte Tiwahe Foundation, an organization dedicated to preserving the language and culture of the Lakota as well as working to institute various projects to help the People in economic, political, and community development. Harvey Iron Boy (52) was a policeman on the Pine Ridge Reservation for over 13 years before an injury forced his early retirement. After that, he became the Diabetes Coordinator for the Porcupine Clinic (a non-profit independent health clinic) where he worked extensively on diabetes prevention and treatment programs, supervising the outreach workers, and often visiting rural patients in their homes throughout the District. Today, he is the Elderly Coordinator and Youth Coordinator for the Porcupine District CAP (Community Action Program) Office as well as contributes his time as a local health activist and volunteer to many elderly families. Iron Boy also currently serves as Vice President of the Porcupine District. David Swallow (56), who assisted and was injured during the 1973 Wounded Knee II occupation, was also a policeman on the Pine Ridge Reservation for 10 years. After receiving a woihamble, a sacred vision, he quit his law position as Lieutenant and underwent many years of training and testing before being recognized by the spiritual Elders as a legitimate medicine bundle keeper, ceremony leader and Medicine Man. He continues his spiritual work today. Additionally, after 8 years as a Sundancer under Chief Frank Fools Crow, Swallow was instructed in 1981 to start his own Sundance (as a branch of the Fools Crow Sundance). 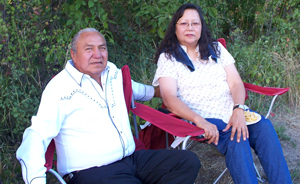 This Sundance still continues each year on his family land north of the community of Porcupine. In 1995, he was also appointed Head Man of the Wana Waygahe (Broken Bow) Band of the Tetunwan Lakota by Chief Leonard Crow Dog. He is a recognized authority on topics regarding Lakota Traditions and Culture and was the spiritual founder of several non-profit organizations which have assisted his people. Further, Swallow is also the founder and currently one of the directors of NATRC, the Native American Tribal Rights Coalition, an organization dedicated to economic, political and community development, treaty rights, judiciary reform, cultural and language preservation, and various other issues on the reservation. The new Head Men spoke in their traditional Lakota language with David Swallow also translating his words into English for those present who did not understand the old language. They expressed their gratitude and awareness of the serious responsibility they were undertaking. It was also clear that all three men saw the many issues they would be confronting. 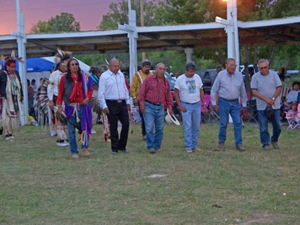 The Head Men move out into the arena to be greeted by the community and pow wow dancers as they walk the circle. Note: This article was originally published on September 02, 2007 on this website.